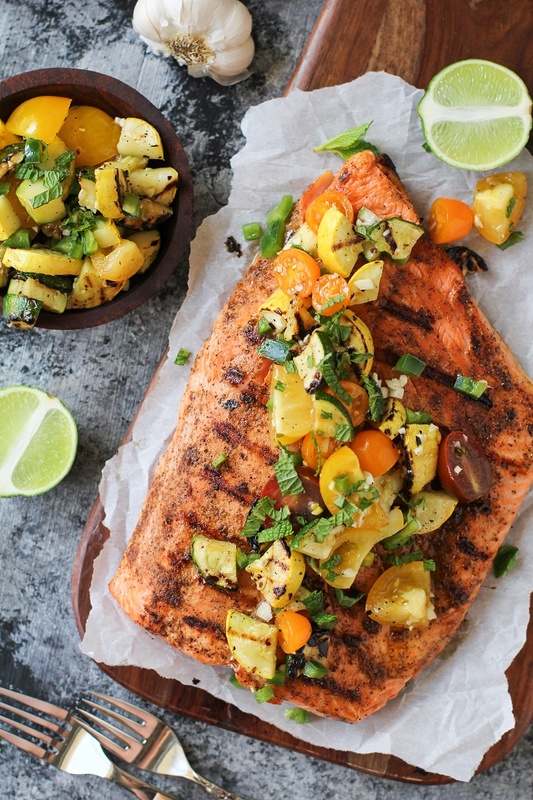 Crispy and tender perfectly cooked grilled salmon with a grilled zucchini and tomato salsa. Okay, okay, so maybe this isn’t the oooooonly grilled salmon recipe you’ll ever need, but it’s a pretty great go-to. 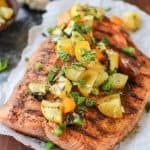 Because I’m savagely into salmon in general and grilled salmon in particular, I figured I would devote this entire post to providing resources for achieving the ultimate grilled salmon. Right here, right meow, I give you my go-to recipe that works (for me) each and every time, bombard you with grilling tips and tricks, and also give suggestions for how you can spruce up your grilled salmon so that it never evah becomes a snooze fest. Way I see it, grilling should be easy peasy, and always produce succulently delicious results. Having a good quality cut of meat or fish fillet is essential to winning at the BBQ thing. 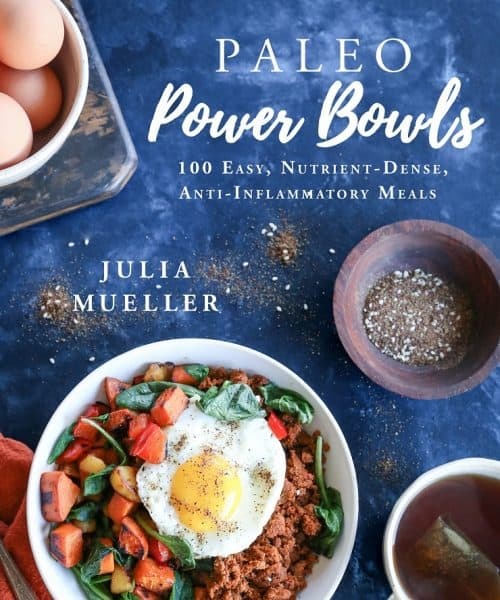 Really what you’re going for is choosing animal protein that speaks for itself and really only requires a dash of salt and pepper, and/or minimal spices for flavor. Choose a skin-on fillet. Grilling salmon without skin can be a mess, as the flesh sticks to the grill and falls through the cracks. Sure, you can grill seafood using a foil packet, but in order to get uber awesome crispy-on-the-outside, tender-on-the-inside smoky BBQ flavor, you’re going to want the skin. Know the differences in the various types of salmon so you know the kind of flavor and texture you’re going to achieve. For instance, Both Sockeye and King salmon have rich flavor, but Sockeye salmon is much leaner than King salmon. In addition, Coho salmon has delicate flavor yet firm texture. When given the option, I always choose the fattiest salmon that will yield the moistest result, but that’s my own personal preference. Pay attention to color and fat marbling. You’re going for uniform light pink fles, free of discoloration or tares with visible, generous streams of fat throughout the fillet. The fat keeps the fish moist and tender and also gives it a great deal of flavor. If you’re feeding a lot of people and choose a large, long salmon fillet, simply cut it in half (or quarters, or serving-size peices) prior to grilling it. This makes the grilling process easier when you go to flip the fish. I want to give some extra attention to sourcing your salmon, as it’s a subject about which I’m pretty passionate. Knowing where my food comes from and feeling content with my ingredient selections is half the fun in cooking for me. I get a feeling of satisfaction each and every time I buy local or domestic goods from a quality source, knowing I did my part in promoting sustainability. Plus, I find fruit, vegetables, and animals that have been grown and harvested with care always yield the freshest, tastiest meals. Copper River Salmon (an organization of fishermen in Cordova, Alaska that brings freshly-caught salmon from the Copper River and Prince William Sound to market) sent me a huge (3-pound-ish) fillet of King Salmon – fresh off the boat! – last week. You may have seen my instagram post of the gorgeous salmon fillet before it hit the grill. King Salmon is known for its super rich flavor, brilliant texture, and high oil content. It has the highest content of omega-3 fatty acids of all the wild salmon species. And you guys…it melts in your mouth. I was so excited upon its arrival that I instantly knew what I wanted to do with it: 1.) Grill 2.) With friends. And wine. All a fillet of this caliber needs is a sprinkle of sea salt and pepper, since the flavor of the fish is so fresh and buttery. I did add some spices to the fillet prior to grilling, but kept them pretty light. Because the fillet was long, I cut it in half in order to make it easier to flip on the grill. The other half, I broiled in the oven, which also turned out magnificently. 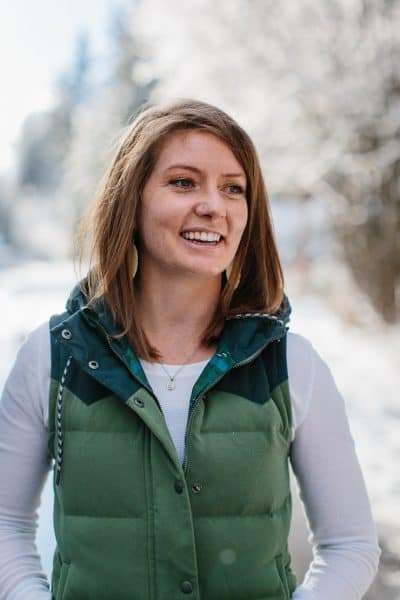 Visit Copper River Salmon’s site and learn more about the organization and its commitment to sustainability. You can also find CRS near you by using their store locator. You’ll be seeing more delicious salmon recipes in the future, courtesy of the folks at Copper River Salmon. ALSO, stay tuned, because I’ll be visiting Cordova, Alaska in September to see the Coho salmon run! My go-to seasonings for a dry rub are: garlic powder, onion powder, chili powder, paprika, cayenne pepper, and sea salt. Boom, that’s all. Simply lightly coat the flesh with olive oil, sprinkle on your seasonings, and you’re ready to grill! You can totally use your favorite spices and dried herbs, or drizzle the fish with lemon juice when it comes off the grill. Store-bought seafood seasoning blends? Those totally work, too! Salmon marinades? I rarely do them. Not because I don’t like salmon that’s been marinated, but because I enjoy my spice rub routine so thoroughly that I don’t even think to plan out a marination session. If you want to try a marinade, I suggest for a stellar olive oil, liquid aminos (or soy sauce), fresh ginger, fresh garlic, sea salt, pure maple syrup or honey. Most of the time when I barbecue, I do the lazy thing and don’t even brush the grill with a wire brush before plunking down the food. I’d avoid taking that approach when you go to grill fish. Take a wire grill brush and get all the leftover food particles from your last grilling experience off. Brush or spray the grill generously with olive oil (do this step BEFORE preheating the grill to avoid any fire flare ups). Place the fish skin-side down on the grill, just over the flame. Cook for 3 to 6 minutes with the cover down without touching the fish. Use a spatula to carefully flip the salmon and cook an additional 2 to 4 minutes, or until the fish reaches desired done-ness. For a 1-inch salmon fillet that is rare on the inside, cook for a total of 6 to 8 minutes. For a 1-inch salmon fillet that is perfectly cooked all the way through, cook for a total of 8 to 10 minutes. For salmon that is thicker than 1-inch, you’ll likely need to adjust the grill time to be closer to 10 to 12 minutes total. Only leave the fish raw on the inside if it’s sushi-grade and can safely be eaten raw. I LOVE serving salmon with a fresh seasonal salsa/chutney. Fruit salsas with mango, pineapple, and/or strawberries are my jam in the summer, and I’m also a fan of a simple avocado-tomato-lime-jalapeno situation. For this particular recipe, I grilled up a zucchini and yellow squash, chopped them up, then added them to a salsa with heirloom cherry tomatoes, garlic, jalapeno, fresh mint, and lime juice. This is just a fun way of taking the experience to the next level. You can also whip up a homemade dressing, vinaigrette, or sauce and drizzle it on the grilled salmon, or simply leave it on the side for dipping if desired. Serving the salmon atop a bed of greens and fresh veggies and fruit as a salad is always awesome. Steaming up some rice and roasting some vegetables is always a choice option, too. Here’s that recipe I’ve been talking about..
Brush your grill with a wire brush to remove any food particles, and coat or spray the grill with cooking oil. Preheat the grill to medium-high (400 to 450 degrees F). Mix together the seasoning and salt in a small bowl until well-combined. Drizzle the fish with olive oil and use your hands to gently coat the full surface of the flesh. Sprinkle the seasoning blend over the fish. NOTE: If you're performing this step ahead of time, store salmon in a seal-able container or plastic bag in the refrigerator until you're ready to grill. Place the salmon fillet on the grill skin side down (I put it over the hottest part of the grill) and cover. Cook for 3 to 6 minutes, or until the skin is super crispy and fish is opaque. Carefully flip and cook an additional 2 to 4 minutes, or until salmon reaches desired done-ness. For rare-in-the-center salmon, cook about 2 minutes per side. Adjust the grill time up for salmon fillets that are thicker than 1 inch. 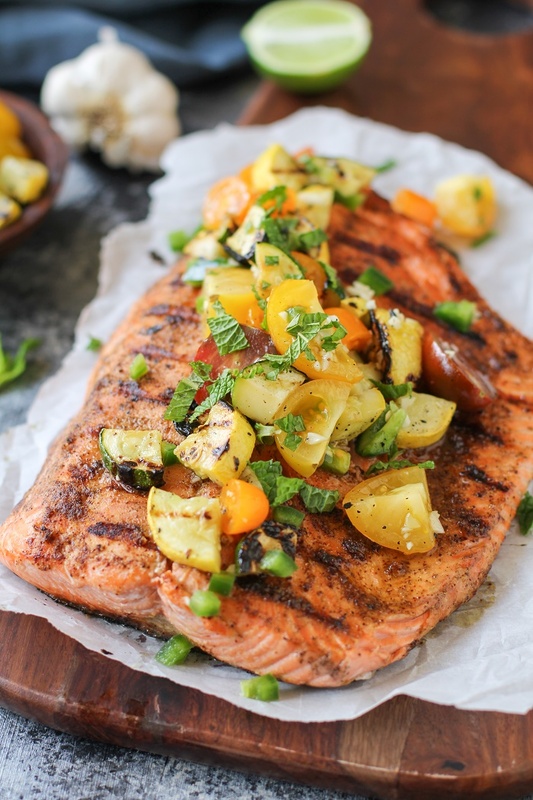 Transfer salmon to a serving platter and serve with grilled zucchini salsa! Grill the zucchini and yellow squash while you're grilling the fish. To do so, cut the zucchini into 1/4 to 1/2-inch thick rounds, lightly coat with olive oil, and sprinkle with salt and pepper. Place zucchini on the grill and cook until grill marks appear, about 2 minutes. Carefully flip and cook on the other side until grill marks appear, another 1 to 2 minutes. Transfer to a cutting board and chop when cool enough to handle. Transfer the chopped grilled zucchini and yellow squash to a mixing bowl. Add the remaining ingredients for the salsa and toss until well-combined. Copper River Salmon supplied the salmon in this recipe. All opinions are my own. Yummy… I love grilled salmon! Thank you for the insightful tips, I had wondered why there was so much difference between the salmon I bought. I love to serve it with forbidden or japonica rice(black rice) for the color contrast. A favorite at a restaurant here serves grilled salmon over lentil salad which is excellent … but a bit of protein overload. Mm… This looks awesome! What a coincidence I just made for dinner yesterday cedar plank salmon and it was so good. I can’t get enough of grilled salmon. It is my favourite and your recipes looks absolutely AMAZING! I learned so much from this post, I feel like I should pay you! I had no idea there were so many different varieties of salmon and that King was…well, the king. I also have no clue how to cook it but I feel like I know everything there is to know after reading this. You left me craving a big ol’ slab of salmon. Did a close derivation of this, over multigrain rice, and the fam loved it. Did a strawberry avocado lime juice chutney (that’s what was on hand…). Thin sockeye fillets, skin on, barely stuck. Marinated it. I’m hero of the day. Great article, thanks.